Egyptian Handmade Glass perfume bottle. 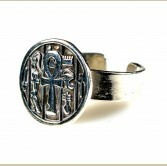 Height: 10 cm Comes in variety of Colors includin..
Our silver Antique-Finish ankh ring is handmade in Egypt. 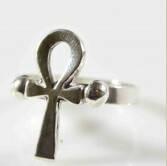 The Ankh in ancient Egypt represented l..
Our silver ankh ring is handmade in Egypt. The Ankh in ancient Egypt represented living & eve..